The hero’s eye still beholds the distant horizon. 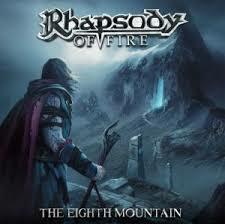 The test of time has generally proven to be an easy pass for the high-impact, fantasy obsessed and dense symphonic landscapes of Rhapsody Of Fire, though recent shifts in this Italian symphonic powerhouse’s lineup and the ascendancy of several competitors have caused some to question if this is the same mighty band that brought such classics as Symphony Of Enchanted Lands and Power Of The Dragonflame into the world. Originally comprised of a longstanding trifecta of greatness between the lofty operatic tenor of Fabio Lione and the virtuoso musicianship and songwriting duo of Luca Turilli and Alex Staropoli, today only the latter of said duo remains with a new regiment of power metal warriors and one short-time early contributor during the mid-90s when the band went under the moniker Thundercross to keep the flame alive. Further complicating things is a sort of growing rivalry between Staropoli and his former counterpart Turilli via a growing number of projects featuring the latter and showcasing a very similar style, leading many to question which of the two is helming the true successor of the Rhapsody franchise. The jury will most likely be out on the aforementioned question for the foreseeable future, but if Staropoli’s camp’s latest studio offering The Eighth Mountain is any indication, they have certainly struck a mighty blow in this ongoing struggle. Following on the heels of what was an astounding return to form in 2016’s Into The Legend and a somewhat controversial compilation (Legendary Years) of rerecorded material from the early days featuring newly recruited front man Giacomo Voli (and proving his salt as a replacement for Fabio Lione in the process in the eyes of this reviewer), this is an album to be reckoned with by any standard. In a similar manner as the aforementioned final album with Lione at the mic, the sonic landscape here is an unapologetic revival of the old sound that this band featured during its five album tenure with Limb Music, most closely resembling their seminal classic sophomore album Symphony Of Enchanted Lands, with a few notable elements of the more aggressive character of Power Of The Dragonflame, with the added benefit of 20 years of advancement of studio technology and the pristine symphonic luster that it permits. Interestingly enough, the ones who ultimately steal the show here are the replacements for the 2/3rds of the original trio that constituted this band’s core. Giacomo’s mighty tenor is maybe a tad less dramatic and distinctive than Lione’s, but also proves to be equally as competent and even slightly more versatile when looking at his occasional interludes into extreme metal vocal territory (“Tales Of A Hero’s Fate” features a flawless emulation of the black metal screaming style frequently employed by Ihsahn during his time with Emperor). Likewise, Luca Turilli’s old friend and former guitar mate Roberto De Micheli lights up the fret board with the fury of a thousand suns from one moment to the next, knocking out signature speed metal infused riff work and sweeping guitar solos to rival Malmsteen like they’re going out of style. All the same, though a pair of impressive showmen weaving awe-inspiring ornamentation at the fringes is what makes this style great, Staropoli’s sense of structure, harmony and texture is what brings it all together, and here he manages to act as both himself and his former collaborator Luca Turilli in their creative prime.